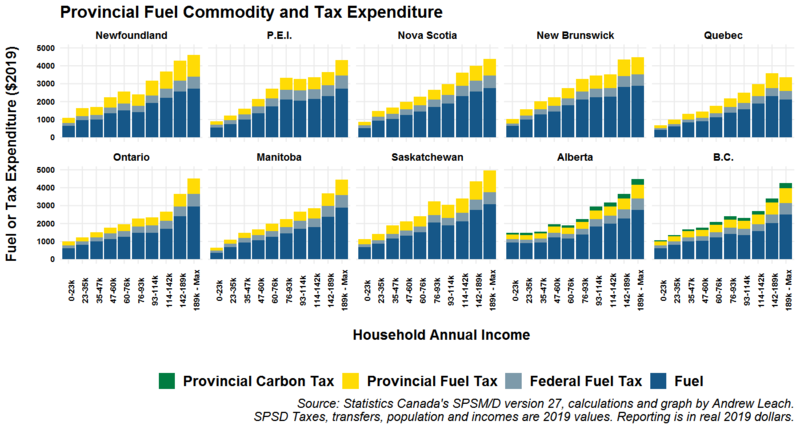 Over the past few days, I’ve been involved in a lot of discussion on Twitter and in other fora about the distribution of transportation fuel expenditures across Canadian households. The purpose of this post is two-fold: first, to eat a little crow for an error of my own, and then to provide some additional data with more explanation and reconciliation. 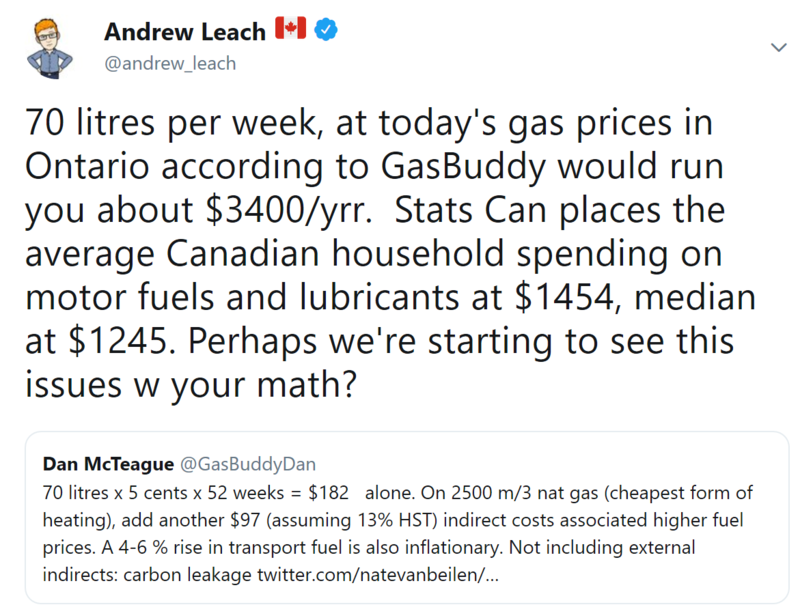 The tabulation I ran before sending this tweet was a quick StatsCan pull which turned out to be commodity expense alone, which ignored taxes including federal and provincial fuels taxes and carbon taxes which apply on fuel purchased. That’s why, as Carnegie Mellon PhD student Arthur Yip pointed out, while Dan’s numbers were high, mine were low. The Statistics Canada Survey of Household Spending actually puts the total expenditure at an average of $2142 per year for 2017. We pay a lot in fuel taxes, so my omission was clearly material. And, just as Dan should have realized that his number was high, I should have realized that my number was too low and gone back to check my data. I didn’t – and so now I’m going to eat a bit of crow. Since I’m eating crow, I might as well turn it into a valuable learning experience. I went back to my SPSD model runs and corrected the error and added a few more details which address some of the questions that have come up in the ensuing conversation. First, I’ve tabulated provincial fuel and fuel tax expenditure by income deciles (the income deciles are national, not provincial). As you can see, there’s a consistent pattern across almost all the data, although there are some outliers: higher income households use, on average, more fuel. Note that because I’m using national income deciles, there will be some small-sample issues in some provinces where significantly more or less than 10% of the provincial population will be in certain income brackets. Importantly, none of the estimates reported below include the new federal carbon charges, since the backstop regulation was not in place by the time this version was completed, and so a full analysis would add that to the values in Saskatchewan, Manitoba, Ontario, and New Brunswick. This analysis is exactly what was prepared by Finance Canada for this report in the Fall 2018 fiscal update, and hopefully we’ll see that update soon in SPSDM. The SPSD model national average expenditure predicted for 2019 is $2308, a little higher than the 2017 figures quoted above from the survey data. The highest average fuel expenditure is in Saskatchewan, predicted at more than $500/year above the national average household expenditure level. The lowest, by far, is in Quebec, with $1924 per household in predicted annual expenses. Note that because Quebec’s cap-and-trade is paid for by distributors, it does not appear directly as a carbon tax in these data. Both Newfoundland and New Brunswick have higher average fuel expenditures than Alberta, owing to higher fuel taxes and commodity costs, although I would have expected the income effect to dominate here and I would have thought Alberta average expenditures on fuel consumption would have been higher. Again, remember that the backstop provinces of New Brunswick, Ontario, Manitoba and Saskatchewan will have higher expenses once the federal carbon charges are implemented. A common thread when discussing fuel (or carbon) taxes is the urban/rural split. I re-ran the data, at the national level, to test how total fuel expenditures change over income levels in communities of different sizes and in rural areas. 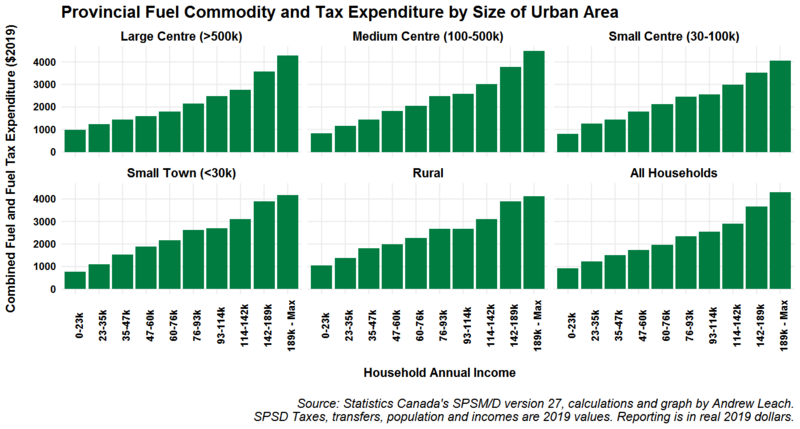 On average, rural households do spend a bit more ($2400 per year combined, vs $2308 for all households), but are only slightly behind the medium-sized urban areas. The small cities and towns have the lowest average expenditure although that is not consistent across all income brackets. 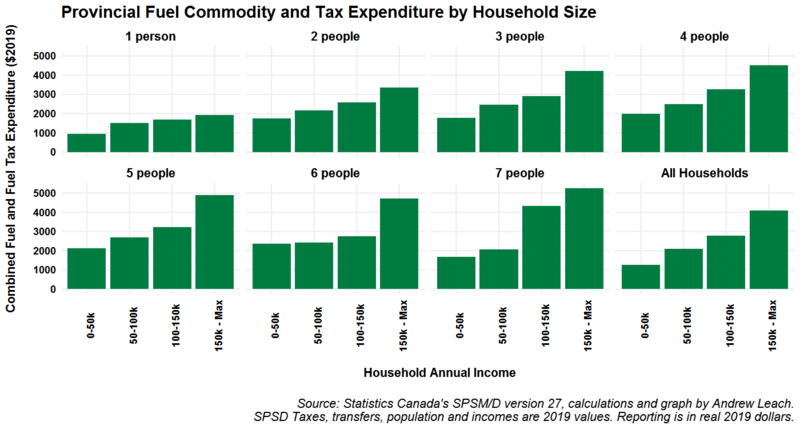 The intuitive feeling that expenditures scale with both income and household size certainly comes out in the data. The larger households are those with the highest annual expenses, in particular at higher income brackets. So, with that, I hope you’ve learned something about how transportation fuel expenses vary across the population. I’ve certainly learned to be more careful with quick data posts to Twitter.